Aim: To analyze and compare the changes in the ultramorphology of dentin in primary teeth using different bonding agents and to study the resin/dentin interface produced by them. Materials and Methods: Occlusal surfaces of 50 extracted human deciduous teeth were grounded to expose the dentin. The teeth were divided into two groups (A) For viewing surface morphology- 18 teeth divided into four groups: (a) for viewing dentinal morphology (3 teeth), (b) Scotchbond multi-purpose (5 teeth), (c) Adhe SE (5 teeth), (d) Futurabond (5 teeth). (B) For viewing interfacial morphology- 32 teeth divided into four groups with 8 teeth each: (a) Scotch Bond Multipurpose (3M, ESPE),), (b) Adhe Se (Vivadent), (c) Optibond All-in-One (Kerr), (d) Futurabond NR (VOCO, Cuxhaven, Germany). The adhesives were applied to each group following the manufacturer's instruction. All the samples were then prepared for viewing under SEM. Results: The photographs were graded using a four-step (0-3) scale method proposed by Ferrari et al. For Scotchbond, 12 (75%) were graded as 2 Grade 3 was observed in only 1 observation in the entire lot of materials. The results obtained for Adhe SE and Optibond AIO were similar, i.e. in 5 (31.25%) observations each the scores were 0 and in 11 (68.75%) observations each the scores were 1. In case of Futurabond, 3 (18.75%) observations were graded as 0 and 13 (81.25%) were graded as 1, thus showing a mean score of 0.81±0.40. Conclusion: Three- step bonding agent results in the complete removal of smear layer. While the self- etch approach is not efficient in removing the smear layer and opening of the dentinal tubules. The longest resin tags with lateral branches were seen in two groups- Scotch bond multipurpose and Optibond FL. Clinical indications for tooth colored restorations have increased with advent of dentine adhesives and composite resin systems. These are used widely as esthetic restorations of anterior and posterior teeth that have multi-surface carious lesions or traumatic destruction. But, failure of these restorations in primary teeth is common owing to smaller tooth size and conservative cavity preparation, leading to poor performance of these materials when used in primary dentition. Moreover, the concentrations of calcium and phosphorus in both peritubular and intertubular dentin are lower in primary teeth. The interface formed in primary teeth is thicker and there is incomplete impregnation of bonding system in the collagen network, resulting in reduced adhesive strength. The aim of the study was to analyze and compare resin/dentin interface produced by different bonding agents. After exposing the dentin and applying the bonding agents the teeth were mounted in acrylic resin with flat dentinal surface facing upwards. Dentin resin interface was viewed for all the five groups. After exposing the dentin and applying the bonding agents, on each sample a block of composite (Esthet X HD, Dentsply) was built by condensing the material into a mould (having 3 mm internal diameter and 2 mm height). The curing of the material was done in increments. The teeth were sectioned vertically through the resin buildups and dentin with help of diamond disc under running water into two halves (mesial and distal) to expose the resin-dentin interface. The opposite surfaces (other than the resin-dentin interface) of the sectioned teeth were embedded in self-cure resin. The resin-dentin interfaces were polished with 600, 1200 grit polishing paper and Sof-lex finishing and polishing systems. Specimens were emerged in 4% NaOCl for 20 min, followed by 20% hydrochloric acid for 30 seconds. The specimens were rinsed with distilled water. All the samples were then sequentially dehydrated in ascending grades of ethanol i.e. 60%, 70%, 80%, 90% alcohol for 20 min each and in 100% alcohol for 1 h.
All samples were dried, mounted on aluminium stubs which were then placed in vacuum chamber and sputter coated with gold layer and were observed under a scanning electron microscope. Series of photographs were taken field by field at a magnification of 2000x and 10000x for viewing the surface morphology. And at 1000x for viewing the dentin resin interface. Score 3- dense resin tags with numerous lateral branches. The evaluation was then subjected to statistical analysis. Analysis of the specimens in cross-sections showed a varied morphology that depended on the various dentin pre-treatments. Treatment with Phosphoric acid resulted in a demineralized layer that appeared to have collapsed in its outer most part. The smear layer was completely removed and the dentin tubules opened. A higher magnification image focus showed some remnants of smear layer [Figure 1]b. The self- etch primer was not sufficient to remove the smear layer and open the dentinal tubules. Remnants of smear layer can be seen on the surface of dentin plugging the tubules [Figure 1]c.
Showed that treatment with this group was strong enough to dissolve the smear plugs. The demineralization was superficial and did not show that noticeable difference between the intertubular or peritubular dentin collar around the tubules lumen. [Figure 1]d.
Group I (Scotch bond multipurpose) had a thick hybridized complex, very long tags (10 to 83.30 μm) with small side branches. The tags were numerous in number with good contact with the hybrid layer. The tags were conical in shape at the base. [Figure 2]a. Group II (Adhe SE) hybridized complex was very thin and irregular, and was not continuous. Length of the tags varied between 0 to 23.30 μm, leaving numerous tubuli empty. [Figure 2]b. Group II (Optibond all-in-one) showed a thin irregular hybridized complex absent in some areas of the interface. Length of the tags varied between 0 to 23.30 μm, broken in few places with numerous empty tubuli. [Figure 2]c.
Group IV (Futurabond NR) hybridized complex was very thin but was comparatively continuous as compared to the above two groups. Length of the tags varied between 0 to 23.30 μm. [Figure 2]d.
Statistical Analysis of the Resin/ Dentin Interface. Analysis was done for all the four adhesive materials were i.e. Scotch Bond, Adhe SE, Optibond All in One and Futurabond. A total of 8 specimen restored with each adhesive material were taken and statistical assessment of their adhesive features was done Visual inspection of two photographs was done. The photographs were graded using a four-step (0-3) scale method proposed by Ferrari et al. Thus, a total of 16 observations for each type of adhesive material. [Table 2] shows the grading scores obtained for different materials under study. Out of 16 observations made for Scotchbond, 3 (18.75%) observed were graded as 1, 12 (75%) were graded as 2 and 1 (6.25%) observation was graded as 3. Grade 3 was observed in only 1 observation in the entire lot of materials. Thus, Scotchbond had a mean score of 1.88 ± 0.50. The results obtained for Adhe SE and Optibond AIO were similar, i.e. in 5 (31.25%) observations each the scores were 0 and in 11 (68.75%) observations each the scores were 1. Both, the materials had a mean value of 0.69 ± 0.48. In case of Futurabond, 3 (18.75%) observations were graded as 0 and 13 (81.25%) were graded as 1, thus showing a mean score of 0.81 ± 0.40. On comparing the data statistically using Kruskall-Wallis test for multiple independent samples (non-parametric variant of ANOVA), a statistically significant difference was seen. [Table 3] shows comparison of different groups with each other, which shows significant differences were seen between-, Scotchbond and Optibond AIO, Scotch bond and Futurabond, Scotchbond and AdheSE with P < 0.001 (highly significant). While the difference between AdheSE and Optibond AIO, AdheSE and Futurabond, Optibond AIO and Futurabond were not significant. Application of these bonding agents also showed a great variance between the groups. The resin tags formed by the three-step bonding agents showed a greater depth of penetration and the number or density of the tags formed was also greater in the three-step bonding agents. The results of our study showed that three-step bonding agents produce more dense and long resin tags, which may be factor responsible for improved strength at the bonding interface. The additional step of etching and rinsing helps in the complete removal of smear layer and better penetration of the adhesive. But, precautions have to be taken to prevent collapsing of the collagen fibers. The only obstruction in the use of three-step adhesives, is the greater number of steps for the application of the adhesive system, which may increase the probability of incorporating errors during the restorative procedure. Two-step self-etching bonding agents can be used as a substitute in primary teeth to reduce the number of applications and operating time, which might become necessary in some cases. However, more research is required in the field of adhesive dentistry to develop such a bonding agent, which combines the mechanical properties of fourth generation bonding agents, requires fewer number of application steps, thus obtaining the best retention and saving on time. Three-step bonding agent resulted in complete removal of smear layer. More dense and numerous tags with lateral branches were seen with three-step bonding agents i.e. Scotchbond multi-purpose. It showed significantly superior results as compared to the other bonding agents. The three simpler versions Futurabond NR, Optibond- all-in-one and Adhe SE did not differ significantly. 1. Tsuchiya S, Nikaido T, Sonoda H, Foxton RM, Tagami J. Ultrastructure of the dentin- adhesive interface after acid- base challenge. J Adhes Dent 2004;6:183-90. 2. Operative Dentistry: Sikri . Textbook of operative dentistry, second edition, Vimal K Sikri. 3. Nakabayashi N, Kojima K, Masuhara E. The promotion of adhesion by the infiltration of monomers into tooth substrates. J Biomed Mater Res 1982;16:265-73. 4. Pashley DH, Carvalho RM. Dentin permeability and dentin adhesion. J Dent 1997;25:355-72. 5. Montes M, Goes MF, Sinhoreti M. The in vitro morphological effects of some current pre-treatments on dentin surface: A SEM evaluation. Oper Dent 2005;30:201-12. 6. Tay FR, Pashely DH. Dental adhesives of the future. J Adhes Dent 2002;4;91-103. 7. Shashikiran ND, Gunda S, Subba Reddy VV. Comparison of Resin-Dentine interface in primary and permanent teeth for three different durations of dentine etching. J Indian Soc Pedod Prev Dent 2002;20:124- 31. 8. Nor JE, Feigal RJ, Dennison JB, Edwards CA. 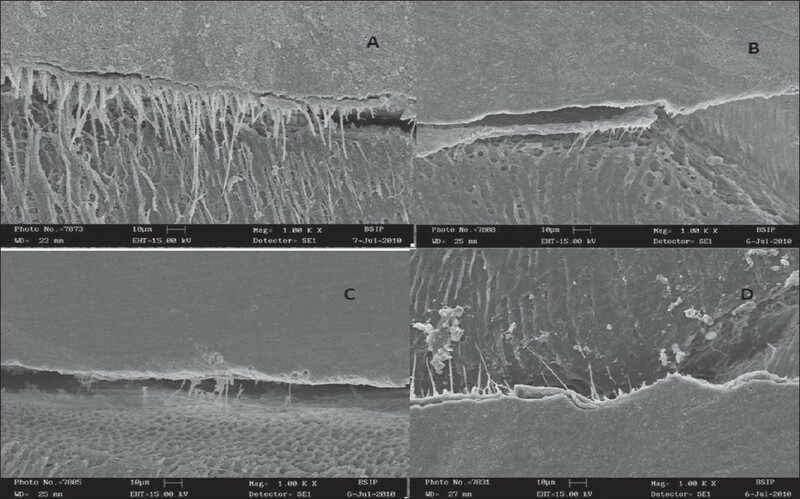 Dentin bonding: SEM comparison of the resin-dentin interface in primary and permanent teeth. J Dent Res 1996;75:1396-403. 9. Miranda C, Maykot Prates LH, de Souza Vieira R, Calvo MC. Shear bond strength of different adhesive systems to primary dentin and enamel. J Clin Pediatr Dent 2006;31:35-40. 10. Perdigao J, Lambrechts P, Van Meerbeek B, Vanherle G, Lopes AL. Field emission SEM comparison of four postfixation drying techniques for human dentin. J Biomed Mater Res 1995;29:1111-20. 11. Da Silveira Teixeira C, Felippe MC, Silva-Sousa YT, De Sousa- Neto MD. Interfacial evaluation of experimentally weakened roots restored with adhesive materials and fibre posts: An SEM analysis. J Dent 2008;36:672-82. 12. Noirrit EE, Gregoire G, Cournot M. Morphological study of fiber- reinforced post- bonding system- root dentin interface by evaluation of two bonding systems. J Dent 2008;36:204-13. 13. Ferrari M, Grandini S, Simonetti M, Monticelli F, Goracci C. Influence of a microbrush on bonding fiber post into root canals under clinical conditions. Oral Surg Oral Med Oral Pathol Oral Radiol Endod 2002;94:627-31. 14. Marshall GW, Marshall SJ, Kinney JH, Balooch M. The dentin substrate: Structure and properties related to bonding. J Dent 1997;25:441-58. 15. Marshall GW. Dentin microstructure and characterization. Quintessence Int 1993;24:606-17. 16. Fogel HM, Marshall FJ, Pashley OH. Effects of distance from the pulp and thickness the hydraulic conductance of human reticular dentin. J Dent Res 1988;67:1381-5. 17. Pashley DH, Cicucchi B, Sano H, Horner JA. Permeability of dentin to adhesive agents. Quintessence Int 1993;24:618-31. 18. Van Meerbeek B, Inokoshi S, Braem M, Lambrechts P, Vanherle G. Morphological aspect of resin-dentine interdiffusion zone with different adhesive system. J Dent Res 1992;71:1530-40. 19. Erickson RL. Surface interactions of dentine adhesive materials. Oper Dent 1992;(Suppl.5):81-94. Volume has not been provided even on the original article. 20. Uekusa S, Yamaguchi K, Miyazaki M, Tsubota K, Kurokawa H, Hosoya Y. Bonding efficacy of single- step self- etch systems to sound primary and permanent tooth dentin. Oper Dent 2006;31:569-76. 21. Gwinnett AJ, Kanca J 3rd. 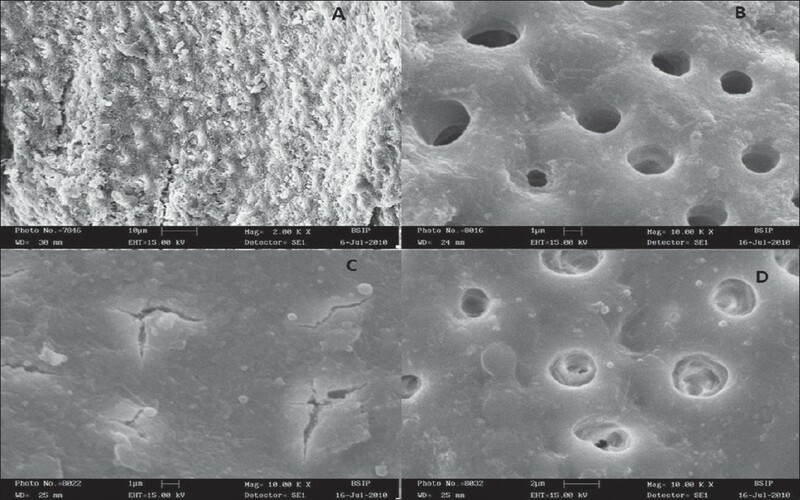 Micromorphological relationship between resin and dentine in vivo and in vitro. Am J Dent 1992;5:19-23. 22. Nakabayashi N. Bonding of restorative materials to dentine: The present status in Japan. Int Dent J 1985;35:145-54. 23. Haller B. Recent development in dentin bonding. Am J Dent 2000;13:44- 50. 24. Chappell RP, Cobb CM, Spencer P, Eick JD. Dentinal tubule anatomosis: A potential factor in adhesive bonding? J Prosthet Dent 1994;72:183-8. 25. Andia-Merlin RY, Garone-Netto N, Arana-Chavez VE. SEM evaluation of the interaction between a three- step adhesive and dentin. Oper Dent 2001;26:440-4. 26. Courson F, Bouter D, Ruse ND, Degrange M. Bond strength of nine current dentin adhesive systems to primary and permanent teeth. J Oral Rehabil 2005;32:296-303. 27. Osorio R, Aguilera FS, Otero PR, Romero M, Osorio E, Garcia-Godoy F, et al. Primary dentin etching time, bond strength and ultra- structure charactrization of dentin surfaces. J Dent 2010;38:222-31. 28. Sardella TN, Alves de Castro FL, Sanabe ME, Hebling J. Shortening of primary dentin etching time and its application on bond strength. J Dent 2005;33:355-62. 29. Camps J, Pashley DH. Buffering action of human dentin in vitro. J Adhes Dent 2000;2:39-50. 30. Casagrande L, Hipolito VD, De Goes MF, De Araujo FB. Bond strength and interfacial morphology of two adhesive systems to deciduous dentin: In vitro study. J Clin Pediatr Dent 2005;29:317-22. 31. Rontani RM, Caldo-Teixeira AS, Sinhoreti MA, Correr Sobrinho L. Etching time evaluation on the shear bond strength of two adhesive systems in primary teeth. Cienc Odontol Bras 2004;7:6-14.